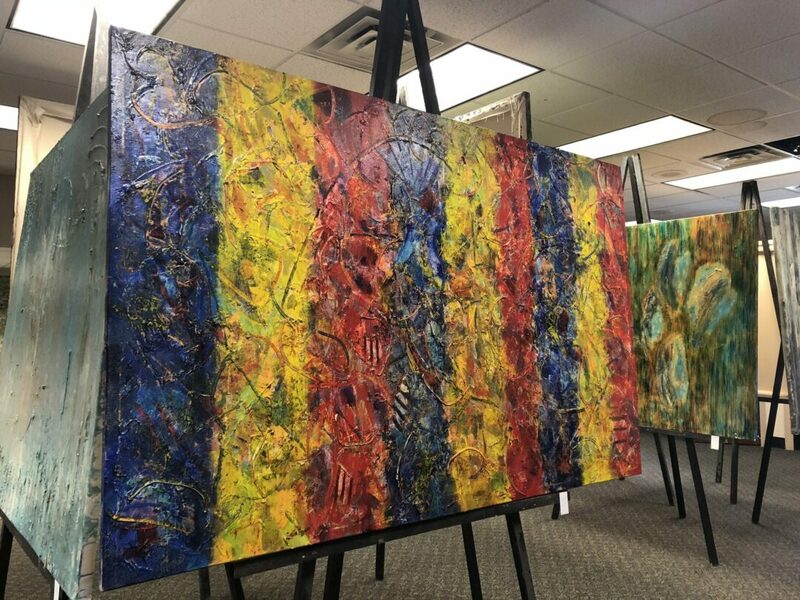 DELMAR—When Delmar resident Pam Skripak walked into a pop-up art exhibit in Tupper Lake with her mother last year, she didn’t expect to encounter the expansive, textured and colorful abstract paintings of Michael Nighswonger, the artist currently showing his work at 343 Delaware Ave. in Delmar. Skripak asked Nighswonger what he was doing hidden away in the Adirondacks. According to the artist, he had moved to Tupper Lake to escape a career that was beginning to feel inauthentic. From Hollywood, Nighswonger began his artistic career as an independent filmmaker in the early days of reality television. He and a partner undertook to drive across the country to get footage for a reality series depicting the lives and struggles of real Americans, push-back against a nascent genre he saw becoming riddled with the sensationalism of man’s worst impulses. Unfortunately, a falling out with his partner forced him to rethink his path when he found himself stranded on the east coast with no money or footage just before the turn of the century. Stuck in Fayetteville, NC, near Fort Bragg, Nighswonger was initially unwilling to give up his vision. It was at a party, while he was talking about the series he wanted to get back to L.A. to make, that a friend asked if he had ever tried painting. Nighswonger said no and, two days later, the same friend showed up with a box of Rembrandt chalks. After three years, Nighswonger moved back to North Carolina to pursue his craft and met with some commercial success. Then, after two large commissions were abruptly rescinded, he returned to the Adirondacks determined to do things his way. He got a job, built a studio and began to create. And that’s where Skripak found him. Wanting to help him promote his work, she invited him to come down to the Capital District, where she has helped him find spaces to show his art. She said that when she saw the For Rent sign on the old TD Bank, she knew it would be perfect. The show, which is free and open to the public, will run through Sunday, March 25, 10 a.m. to 8 p.m. While Nighswonger will be on hand to talk with visitors every day, special artist talks are scheduled to take place at 2 p.m. on Monday, March 19, and at 7 p.m. on Wednesday, March 21. Children’s art activities, such as a color scavenger hunt, have been planned as well, according to Skripak. Bethlehem Supervisor David VanLuven and his wife listen to Nighswonger talk about this pair of paintings on the 2nd floor of 343 Delaware Avenue. Pam Skripak makes sure a 2nd floor painting is secure on makeshift paint can supports. For additional information, call: (518) 577-6068.